A post last month discussed the U.S. district court’s delay of proceedings regarding the proposed extradition of Inocente Orlando Montano, a former Salvadoran military officer, to Spain for trial for his alleged participation in the 1989 murders of Jesuit priests in El Salvador. The reason was the court’s desire for additional briefing on some of the issues. In the meantime the U.S. submitted a brief addressing whether the U.S.-Spain extradition treaty’s requirement for “dual criminality” was satisfied and whether U.S. due process requirements would be met by an extradition of Montano. Now we wait to see if Montano’s attorney responds to the government’s brief on the merits and whether Montano’s health will permit further proceedings. Motion for Conditional Release During Pendency of Habeas Proceedings, Morales v. Elks, No. 5:16-HC-2066-BO (E.D.N.C. Apr. 7, 2017); Order, Morales v. Elks, No. 5:16-HC-2066-BO (E.D.N.C. Apr. 28, 2017). Amended Memorandum in Support of Motion To Dismiss Application for Writ of Habeas Corpus, Morales v. Elks, No. 5:16-HC-2066-BO (E.D.N.C. Apr. 17, 2017). Previous posts have reported that the National Court of Spain in 2008 commenced a criminal investigation of the 1989 murder of six Jesuit priests and their housekeeper and her daughter in El Salvador. In May 2011 the Spanish court issued the equivalent of an indictment of 20 former Salvadoran military officials for their alleged involvement in those murders. One of these defendants had died; one had been living in the U.S.; two have been cooperating with the Spanish investigation; and the whereabouts of three are unknown. The other 13 are believed to be living in El Salvador. Ever since May 2011 Spanish authorities have been seeking extradition of 13 of these men from El Salvador and one from the United States. But extradition has not happened yet. Here is an update on the status of those efforts. In December 2011 Spain requested extradition of 13 of them who were then believed to be in El Salvador. In May 2012, however, the Supreme Court of El Salvador denied extradition of the 13 on the ground that the country’s constitution prohibited extradition of its citizens. In August 2015, in an unrelated case, the Constitutional Chamber of the Salvadoran Supreme Court ruled that, according to a treaty on international cooperation in criminal matters to which El Salvador is a party, an INTERPOL red notice requires both the identification of the location of the defendants and their arrest and detention pending an additional filing, such as an extradition request. This decision appeared to be in direct conflict with the just mentioned Court’s May 2012 ruling against extradition in the Spanish case. In response to the August 2015 ruling, the Salvadoran Human Rights Ombudsman, David Morales, on November 16, 2015, petitioned the country’s Supreme Court to review its 2012 decisions refusing to arrest and order the extradition of 13 former military officials who were subjects of the INTERPOL arrest warrants. The Ombusman also issued a resolution asking Spanish authorities to re-issue the arrest warrants for extradition purposes in this case. This request was endorsed in the Spanish case by the U.S.-based Center for Justice and Accountability (CJA) and the Spanish Association for Human Rights (APDHE). On January 4, 2016, the Spanish court’s Judge Velasco honored that plea by requesting INTERPOL to re-issue the international arrest warrants for all the Jesuit Massacre case defendants who reside in El Salvador for their extradition to Spain to face the charges. On January 6, the Salvadoran government said it will cooperate in the execution of those warrants and the extradition of former Salvadoran military officials and soldiers, but that the country’s Supreme Court would make the final decision. In February 2016 Salvadoran authorities arrested and detained four of the former Salvadoran military officials who are sought for this Spanish criminal case. The four were former colonel Guillermo Alfredo Benavides Moreno; former sergeants Ramiro Ávalos Vargas and Tomás Zárpate Castillo; and former corporal Ángel Pérez Vásquez. The Salvadoran National Civilian Police (PNC) force said that it would “continue the search and capture of the rest of the wanted persons and will inform the public in the opportune moment.” To date, however, no additional arrests have been reported. On July 14, 2016, the full Supreme Court of El Salvador was scheduled to release its decision on the latest request to issue extradition warrants in this case. The day before, however, the Constitutional Chamber of the Court decided that the country’s Amnesty Law was unconstitutional, which was discussed in a prior post. As a result, the full Supreme Court stayed further proceedings about the extradition warrants. The Supreme Court, however, has not yet ruled on the request to extradite the other three men– former sergeants Ramiro Ávalos Vargas and Tomás Zárpate Castillo; and former corporal Ángel Pérez Vásquez. They also were tried by a Salvadoran court for illegal homicide, which is an essential element of the crime now being pursued in Spain, but these three men were acquitted in a Salvadoran trial with many alleged irregularities. Strict application of the rationale of the above Supreme Court decision and the cited provision of the extradition treaty and the underlying notion of no double jeopardy suggest that they too should not be subject to extradition, but the irregularities in their trial are impediments to that analysis. We now await the Salvadoran Supreme Court’s ruling on these three men. On April 1, 2016, Montano filed in that court an Application for a Writ of Habeas Corpus, which is the only way for him to appeal or challenge that decision. On April 26, the U.S. moved to dismiss that habeas application. Its brief argued that the certification of extraditability would not be overturned if there was any evidence warranting the finding that there was a reasonable ground to believe that the individual was guilty of the crime in the foreign country and that there was such evidence in this case. On June 10 the U.S. submitted its reply to the petitioner’s opposition to the dismissal motion; it argued that the response raised no issues needing further rebuttal. The matter is now submitted for decision by U.S. District Judge Terrance W. Boyle. Prior posts covered the marvelous ministries of these Jesuit priests and their university (University of Central America or UCA); the circumstances of their horrible murders; the Salvadoran military’s attempted cover-up of their involvement in these crimes; the flawed Salvadoran criminal prosecution of a few of the military personnel so involved and their absolution by a Salvadoran amnesty law; the investigation and report on these crimes by the Truth Commission for El Salvador; other legal proceedings regarding these crimes; the Spanish criminal case over these crimes; El Salvador’s 2012 denial of Spain’s request for extradition of most of the suspects in the case; and the commemoration of the 25th anniversary of the Jesuit martyrs in November 2014. These posts are identified in reverse chronological order of posting in a computer-generated list. They also are identified in logical sequence in “The Jesuit Priests” section of my manually prepared List of Posts to dwkcommentaires—Topical: El Salvador. There also is extensive discussion of the Spanish case in the website of the Center for Justice and Accountability, the U.S.-based human rights organization that is involved in that case. Spanish Judge Re-Issues Request for the Arrest of Military Officials, CJA (Dec. 2015); Dalton, Spain calls for arrest of 18 soldiers accused of killing priests in El Salvador, El Pais (Dec. 23, 2015); Reuters, El Salvador will cooperate in arrest of 17 former soldiers accused of killing priests, Guardian (Jan. 6, 2015); Labrador, Spain orders again capture Jesuit Salvadoran military case, El Faro (Jan. 5, 2016). Human Rights Ombudsman asks extradition slaughter of Jesuits, El Mundo (Nov. 16, 2015). Labrador, Arauza & Zabiań, Court refuses to extradite Colonel Benavides, but agrees to send him to prison, El Faro (Aug. 17, 2016); Melendez, Supreme Court Decides Not To Extradite Jesuit Case, LaPrensa Grafica (Aug. 17, 2016); Reuters, El Salvador Court Denies Extradition of former Colonel to Spain, N.Y. Times (Aug. 17, 2016). The Salvadoran trial was covered in a prior post as was the release of Colonel Benavides under the Amnesty Law. Application for a Writ of Habeas Corpus Pursuant to 28 U.S.C. 2241, et seq, Montano Morales v. Elks, No. 5:16-HC-2066-BO (April 1, 2016). Memorandum in Support of Motion To Dismiss Application for Writ of Habeas Corpus, Montano Morales v. Elks, No. 5:16-HC-2066-BO (April 26, 2016); Response in Opposition to Federal Respondents’ Motion To Dismiss Application for Writ of Habeas Corpus, and Request for Hearing, Montano Morales v. Elks, No. 5:16-HC-2066-BO (May 18, 2016); United States’ Reply to Petitioner’s Response in Opposition Regarding Motion To Dismiss Application for Writ of Habeas Corpus, Montano Morales v. Elks, No. 5:16-HC-2066-BO (June 10, 2016). Supplemental Filing To Support Petition for Write of Habeas Corpus and Request for Hearing, Montano Morales v. Elks, No. 5:16-HC-2066-BO (July 21, 2016); Government’s Response to Supplemental Filing To Support Petition for Writ of Habeas Corpus, Montano Morales v. Elks, No. 5:16-HC-2066-BO (Aug. 10, 2016). Cooper & Hodges, Extradition appeal among setbacks in Jesuit massacre, Nat’l Cath. Rep. (April 13, 2016); Assoc. Press, Ex-Salvadoran colonel fights extradition in Jesuit killings (Apr. 1, 2016). That process is now a hot topic in the U.S. Most recently Turkey is pressing the U.S. to extradite Fethullah Gulen, a Muslim cleric living in Pennsylvania, to Turkey to face charges of being involved in the attempted coup in that country. Another pending request, this from Spain, seeks the U.S. extradition of Inocente Orlando Montano Morales, a former Salvadoran military officer living in the U.S., to face criminal charges involving the 1989 murders of Jesuit priests in El Salvador. Extradition also is one of the many unresolved issues in the process of normalizing U.S.-Cuba relations: will Cuba extradite certain U.S. fugitives and will the U.S. do likewise for certain Cuban fugitives. Therefore, a better understanding of international extradition is necessary to follow these developments. Such a primer can be found in a 2001 U.S. State Department report to Congress and a recent U.S. government brief in the previously mentioned Spanish case for extradition of the former Salvadoran military officer from the U.S. Assuming those sources are fair summaries of the process, this post omits citations to statutes and cases other than to note that extradition is the subject of 18 U.S. Code, Chapter 209. U.S. extradition practice is based almost entirely on individually negotiated bilateral treaties, which the U.S. brings into force following Senate advice and consent to ratification. The U.S. is currently a party to 109 such treaties. While most of these treaties currently in force have been negotiated in the last 30-40 years, many of the treaties still in force are quite old, in some cases dating back to the 19th Century. For many reasons, however, not every request for extradition results in a fugitive being delivered to the requesting country. Sometimes the requesting state doesn’t know where a fugitive is located and makes multiple contingency requests for provisional arrest and extradition. In other cases, fugitives learn they are being sought and flee or go into hiding. Even following a fugitive’s arrest, court proceedings and appeals can last a very long time and can be delayed by fugitives’ exercising all possible rights to challenge extradition. An almost universal treaty exception, known in international extradition law as the “non bis in idem” doctrine, is similar to the double jeopardy doctrine under U.S. domestic law. It provides that extradition will be denied when the person has already been either acquitted or convicted for the same offense in the country from which extradition is requested, or, in some instances, in a third country. A similarly widely adopted exception is that extradition is not required where the crime at issue is a “political offense” (a term which can cover treason, sedition or other crime against the state without the elements of any ordinary crime, or which under U.S. law can cover ordinary crimes committed incidental to or in furtherance of a violent political uprising such as a war, revolution or rebellion, especially when such crimes do not target civilian victims) or a “military offense” (a crime subject to military law that is not criminalized under normal penal law). U.S. treaties also typically provide that extradition may be denied if the request is found to be politically motivated. Some of our treaties provide that extradition may be denied if the request was made for the primary purpose of prosecuting or punishing the person sought on account of race, religion, nationality or political opinion. Perhaps the highest profile exceptions to the obligation to extradite are bars or limitations in some countries on the extradition of their own nationals. The U.S., however, makes no distinction between extraditing its own nationals and those of other countries and advocates that all countries adopt the U.S. policy due to the ease of flight and the increasingly transnational nature of crime. Some U.S. treaties provide that if the offense for which surrender is sought is punishable by death under the laws in the country requesting extradition but not in the country holding the fugitive, extradition may be refused unless the requesting country provides assurances that the death penalty will not be imposed or, if imposed, will not be carried out. Sometimes these provisions are included in the treaty at the insistence of our treaty partner, because many countries in Europe and elsewhere oppose the death penalty. Sometimes the U.S. insists on such provisions in order to retain sufficient flexibility to ensure that the U.S. is not obliged to surrender persons for execution for relatively less serious crimes. Older U.S. treaties that were negotiated before the late 1970’s contained a list of offenses that would be covered. In newer U.S. treaties this list approach has been replaced by the concept of “dual criminality,” usually providing that offenses covered by the treaty include all those made punishable under the laws of both parties by imprisonment or other form of detention for more than one year, or by a more severe penalty (such as capital punishment). Such a formulation obviates the need to renegotiate the treaty to provide coverage for new offenses, strikingly exemplified by the currently evolving area of cyber-crime. Indeed, to avoid having the dual criminality analysis applied too narrowly, most treaties provide further guidance, including that an offense is extraditable whether or not the laws in the two countries place the offense within the same category or describe it by the same terminology. A major goal in the U.S. current ambitious treaty-negotiating program is to negotiate new, modern treaties that eliminate the “list” approach in favor of dual criminality treaties. Other limitations on the obligation to extradite, which vary to some extent from treaty to treaty, would relate to requests for extradition for extraterritorial offenses where the two countries’ laws differ on the reach of jurisdiction over such crimes. In such cases, the U.S. seeks the greatest possible flexibility in our treaties to permit extradition for offenses that have taken place in whole or in part outside the territory of the requesting party. The U.S. practice regarding foreign government requests for extradition involves the Department of State, the Department of Justice, a U.S. attorney, a U.S. district court and the Secretary of State. The extradition process in the U.S. starts when the Department of State receives a request for extradition from a foreign country. That Department initially determines whether the request is governed by a treaty between the U.S. and that country, and if there is such a treaty and the request conforms to the treaty, that Department will prepare a declaration authenticating the request and send it to the U.S. Department of Justice’s Office of International Affairs. The Justice Department’s Office of International Affairs examines the foreign country’s request to determine if it contains all of the necessary information. If it does, the request is sent to the U.S. Attorney for the district where the subject of the request is located. Thereafter the Office’s attorneys will assist, as needed, the U.S. Attorney. The U.S. Attorney then prepares and files a complaint with the local U.S. district court seeking a warrant for the individual’s arrest and certification that he or she may be extradited. The U.S. Attorney also files briefs and appears at any hearings in the district court in the case. The complaint, of course, is served upon the subject of the proceeding, who has a right to be represented by counsel and to contest the complaint. The court then conducts a hearing to determine if there is probable cause that the subject has violated one or more of the criminal laws of the country seeking extradition. This is not a criminal trial, but like a preliminary hearing in a criminal case to determine if the evidence is sufficient to sustain the charge under the treaty’s provisions. At such a hearing, the Federal Rules of Civil Procedure, Criminal Procedure and Evidence do not apply. Thus, the evidence may consist of hearsay and unsworn statements, and the judicial officer does not weigh conflicting evidence and make factual determinations. Instead the officer only decides whether there is competent evidence to support the belief that the individual has committed the charged offense under the other country’s laws. At this hearing, the individual has no right to submit a defense to the charges or evidence that merely contradicts the other country’s proof or poses conflicts of credibility. If the court finds after the hearing that (a) there is a criminal charge pending in the other country against the individual; (b) the offense underlying the charge is encompassed by the relevant treaty; (c) the individual is the person sought by the foreign government; (d) the evidence supports a finding that the crime for which the individual is sought was committed; (e) the evidence supports a finding that the individual committed the crime; and (f) the treaty has no other basis for denying extradition; then the court issues a certification that the individual is subject to extradition. Such a certification may be challenged only by the individual’s filing a petition for a writ of habeas corpus to the same district court. If there is no petition or it is denied, the court sends the certification to the Secretary of State. Under U.S. statutes, the Secretary of State is the U.S. official responsible for determining whether to surrender a fugitive to a requesting state. In making this decision, the Secretary may consider issues properly raised before the extradition court or a habeas court as well as any humanitarian or other considerations for or against surrender, including whether surrender may violate the United States’ obligations under the Convention Against Torture. The Secretary also will consider any written materials submitted by the fugitive, his or her counsel, or other interested parties. If the Secretary decides to extradite, the Secretary issues and serves a warrant for the extradition, and the individual is extradited to the other country. U.S. State Dep’t, Report on International Extradition Submitted to the Congress Pursuant to Section 211 of the Admiral James W. Nance and Meg Donovan Foreign Relations Authorization Act, Fiscal Years 2000 and 2001 (Public Law 106-113) (2001); U.S. Justice Dep’t, Frequently Asked Questions Regarding Extradition;Memorandum in Support of Motion To Dismiss Application for Habeas Corpus at 2, Montano Morales v. Elks, No. 5-16-HC-2066-BO (E.D.N.C. April 26, 2016). Future posts will examine the requests from Spain and Turkey while an earlier post reviewed a district court’s issuance of the certification for extradition to Spain of the former Salvadoran military officer: Resumption of Spanish Criminal Case Over 1989 Salvadoran Murder of Jesuit Priests?, dwkcommentaries.com (Feb. 6, 2016). Another post reviewed U.S. and Cuban extradition issues: Issues Regarding Cuba and U.S. Extradition of the Other’s Fugitives, dwkcommentaries.com (Feb. 24, 2015). The U.S. currently has bilateral extradition treaties with 109 countries. Justice Dep’t, Office of International Affairs. A prior post erroneously stated that such a certification was subject to an ordinary appeal to the relevant U.S. court of appeals. On July 13, the Constitutional Chamber of the Supreme Court of El Salvador decided, 4 to 1, that the country’s amnesty law of 1993 was unconstitutional. This post will examine that decision and a subsequent post will discuss the impact of that decision on the pending criminal case in Spain regarding the 1989 murders of the Jesuit priests in El Salvador. The Chamber held that the country’s amnesty law of 1993 was unconstitutional because it was “contrary to the access to justice” and the “protection of fundamental rights” as impeding the state from fulfilling its obligation to investigate, try and punish grave violations of those rights. Indeed, the court said the government has an obligation to “investigate, identify and sanction the material and intellectual authors of human rights crimes and grave war crimes” in its civil war and to provide reparations to victims. The court also suggested that prosecutors begin with about 30 cases highlighted by a U.N. Truth Commission in March 1993. The cases include massacres, assassinations and kidnappings by combatants from both the armed forces and the guerrilla army called the Farabundo Martí National Liberation Front (FMLN). One of the most prominent was the 1989 murders of the Jesuit priests and their housekeeper and her daughter. The court’s announcement of its decision stated that the 1992 Peace Accords ending the civil war had contained no provision for an amnesty; that the country’s National Assembly had no power to grant an amnesty to persons who had committed crimes against humanity or war crimes constituting grave violations of human rights and that its constitution and international law of human rights required the conclusion of invalidity. The court also stated that the crimes against humanity during the civil war were not individual and isolated acts, but the result of guidelines and orders issued by organized apparatuses of power with hierarchies of command. This implies criminal responsibility of the direct actors, those who gave the orders for the crimes and those commanders who failed to countermand the orders and thereby failed to exercise control over the hierarchies. Positive Reactions to the Decision. The next day the decision was celebrated at a ceremony in San Salvador’s Cuscatlan Park, the site of a 275-foot granite wall etched with the names of 30,000 civilians killed in the country’s civil war and the locations of nearly 200 massacres committed between 1970 and 1991. Below are photographs of David Morales,El Salvador’s human rights ombudsman, who made remarks that day, and of part of the granite wall. At this celebration, David Morales said, “If prosecutors and judges are willing to comply with the ruling, it will generate for the first time in El Salvador the first glimmers of reconciliation.” He added that many Latin American countries have already abolished their amnesty laws and begun to prosecute crimes dating to the civil wars and military dictatorships of the late 20th century. Another voice of support for the decision came in a New York Times editorial calling it “ a remarkable ruling that opens the door for relatives of victims of war crimes to hold torturers and killers accountable.” “However,” the editorial continued, “there appears to be little political will in El Salvador to revisit a painful chapter of its history in courtrooms. Politicians across the political spectrum have questioned the viability of war crimes tribunals at a time when the country’s judicial institutions are overwhelmed by endemic gang violence.” Nevertheless, the Times suggested that El Salvador should create “a prosecution unit and gives it the tools and independence to pursue the most emblematic cases of the conflict” like the El Mozote Massacre,” which has been discussed in prior posts. Negative Reactions to the Decision. Mauricio Ernesto Vargas, a retired general who represented the armed forces in the peace negotiations, said the court’s ruling could intensify political polarization in a country with no shortage of problems: a gang-violence epidemic, a migration crisis, crop failures and economic stagnation. The conservative political party ARENA (founded by a leader of the death squads in the 1970s and 1980s, and in control of the government when atrocities like the massacre of the Jesuits occurred and the authors of the amnesty law) published an official statement urging respect for the court’s decisions, but also noting that the decisions would present challenges for the process of reconciliation and the strengthening of democracy and institutions. El Salvador Supreme Court (Constitutional Chamber), Press Release (July 13, 2016), http://static.ow.ly/docs/20.%20Comunicado%2013-VII-2016%20Ley%20de%20amnist%C3%ADa_50Yr.pdf; Post war 1993 amnesty law declared unconstitutional, Tim’s El Salvador Blog (July 13, 2016), http://luterano.blogspot.com/2016/07/post-war-1993-amnesty-law-declared.html; Malkin & Palumbo, Salvadoran Court Overturns Wartime Amnesty, Paving Way for Prosecutions, N.Y. Times (July 14, 2016); Maslin, El Salvador strikes down amnesty for crimes during its civil war, Wash. Post (July 14, 2016), https://www.washingtonpost.com/world/the_americas/el-salvador-strikes-down-amnesty-for-crimes-during-its-civil-war/2016/07/14/5eeef2ec-49bf-11e6-8dac-0c6e4accc5b1_story.html. Prior posts have discussed the Amnesty Law: International Criminal Justice: El Salvador’s General Amnesty Law and Its Impact on the Jesuits Case, dwkcommentaries.com (June 11, 2011), https://dwkcommentaries.com/2011/06/11/international-criminal-justice-el-salvadors-general-amnesty-law-and-its-impact-on-the-jesuits-case; El Salvador’s Current Controversy Over Its General Amnesty Law and Supreme Court, dwkcommentaries.com (June 16, 2011), https://dwkcommentaries.com/2011/06/16/el-salvadors-current-controversy-over-its-general-amnesty-law-and-supreme-court; The El Mozote Massacre: The Truth Commission for El Salvador and the Subsequent General Amnesty Law and Dismissal of the Criminal Case, dwkcommentaries.com (Dec. 13, 2012), https://dwkcommentaries.com/2012/12/13/the-el-mozote-massacre-the-truth-commission-for-el-salvador-and-the-subsequent-salvadoran-general-amnesty-law-and-dismissal-of-criminal-case. It should be noted, however, that U.S. federal courts have held that the General Amnesty Law is limited to Salvadoran judicial proceedings and thus does not bar U.S. civil lawsuits for money damages against Salvadoran defendants. (El Salvador’s General Amnesty Law in U.S. Federal Courts, dwkcommentaries.com (June 14, 2011), https://dwkcommentaries.com/2011/06/14/el-salvadors-general-amnesty-law-in-u-s-federal-court-cases. Prior posts have discussed the Truth Commission: International Criminal Justice: The Jesuits Case in the Truth Commission for El Salvador, dwkcommentaries.com (June 9, 2011), https://dwkcommentaries.com/2011/06/09/international-criminal-justice-the-jesuits-case-in-the-truth-commission-for-el-salvador; The Salvadoran Truth Commission’s Investigation of the 1980 Murders of the Four Churchwomen, dwkcommentaries (Dec. 19, 2011), https://dwkcommentaries.com/2011/12/19/the-salvadoran-truth-commissions-investigation-of-the-murders-of-the-four-american-churchwomen; The El Mozote Massacre: The Truth Commission for El Salvador and the Subsequent General Amnesty Law and Dismissal of the Criminal Case, dwkcommentaries.com (Dec. 13, 2012), https://dwkcommentaries.com/2012/12/13/the-el-mozote-massacre-the-truth-commission-for-el-salvador-and-the-subsequent-salvadoran-general-amnesty-law-and-dismissal-of-criminal-case. Thanks for Tim’s El Salvador Blog (http://luterano.blog spot.com) for much of the information on the reactions to the Chamber’s decision. David Morales: The sentence “is a tool of greater scope to demand justice, DiarioCoLatino (July 14, 2016) http://www.diariocolatino.com/david-morales-la-sentencia-es-una-herramienta-de-mayores-alcances-para-exigir-justicia; Dalton, Declared unconstitutional the amnesty in El Salvador, El Pais (July 14, 2016) http://internacional.elpais.com/internacional/2016/07/15/america/1468541983_506876.html. Resumption of Spanish Criminal Case Over 1989 Salvadoran Murder of Jesuit Priests? As discussed in a prior posts, Spain’s National Court in 2008 commenced a criminal investigation of the 1989 murder of six Jesuit priests and their housekeeper and her daughter in El Salvador. In May 2011 the Spanish court issued the equivalent of an indictment of 20 former Salvadoran military officials for their alleged involvement in those murders. Now there are signs in the U.S., Spain and El Salvador that the case will be resumed. On April 8, 2015, the U.S. Department of Justice filed a complaint for U.S. extradition of Montano to Spain. A hearing on that complaint was held on August 19, 2015, before U.S. Magistrate Judge Kimberly Swank, U.S. District Court (Eastern District, North Carolina). Therefore, the Magistrate Judge concluded that Montano was subject to extradition and certified this finding to the U.S. Secretary of State as required by 18 U.S.C. § 3184. Under the previously mentioned U.S. federal statute (18 U.S.C. § 3184) the Secretary of State “shall issue his warrant for the commitment of the person so charged to the proper jail, there to remain until such surrender shall be made.” This statute on its face does not appear to grant the Secretary the discretion to deny the request for extradition. Moreover, since the U.S. Department of Justice brought the prosecution of Montano for immigration fraud and then for his extradition, it appears exceedingly unlikely that Secretary of State John Kerry would not provide the necessary warrant for extradition. Now we wait to see if Montano exercises his right under Federal Rule of Civil Procedure 73 (c) and Federal Rule of Appellate Procedure 4(a) to appeal this decision to the U.S. Court of Appeals for the Fourth Circuit within 30 days “after entry of the judgment or order being appealed from,” which presumably is February 5. In August 2015, in an unrelated case, the Constitutional Chamber of the Salvadoran Supreme Court ruled that, according to a treaty on international cooperation in criminal matters to which El Salvador is a party, an INTERPOL red notice requires both the identification of the location of the defendants and their arrest and detention pending an additional filing, such as an extradition request. This decision appears in direct conflict with the Court’s May 2012 ruling against extradition in the Spanish case over the Jesuit murders. The Ombudsman also issued a resolution asking Spanish authorities to re-issue the arrest warrants, for extradition purposes in the Jesuits Massacre Case. This request was endorsed in the Spanish case by CJA and the Spanish Association for Human Rights (APDHE). On January 4, 2006, the Spanish court’s Judge Velasco honored that plea by requesting INTERPOL to re-issue the international arrest warrants for all the Jesuit Massacre case defendants who reside in El Salvador for their extradition to Spain to face the charges. On January 6, the Salvadoran government said it will cooperate in the execution of those warrants and the extradition of 17 former Salvadoran military officials and soldiers (one of whom is the previously mentioned Montano in the U.S.), but that the country’s Supreme Court would make the final decision. On February 5 and 6, 2016, Salvadoran police detained four of the 17 former military officials. The police also are looking for the other 12 (excluding Montano). This is despite some earlier police reluctance to do so. These arrests and searches are seen as a first step towards extradition. These actions were endorsed on February 6 by President Salvador Sanchez Ceren, who stressed that the country was “committed to comply with international standards” and that there were INTERRPOL red notices calling for arrest. He also urged those subject to arrest to comply for decision on extradition to be made by the Supreme Court. There now appears to be some hope that those accused of complicity in the murder of the Jesuits will face criminal charges in Spain. The main obstacle now is the Salvadoran Supreme Court, which will have to decide whether the new arrest warrants and request for extradition will be honored. Prior posts that were tagged “Jesuits” covered the marvelous ministries of these Jesuit priests and their university (University of Central America or UCA); the circumstances of their horrible murders; the Salvadoran military’s attempted cover-up of their involvement in these crimes; the flawed Salvadoran criminal prosecution of a few of the military personnel so involved and their absolution by a Salvadoran amnesty law; the investigation and report on these crimes by the Truth Commission for El Salvador; other legal proceedings regarding these crimes; the Spanish criminal case over these crimes; El Salvador’s 2012 denial of Spain’s request for extradition of most of the suspects in the case; and the commemoration of the 25th anniversary of the Jesuit martyrs in November 2014. Prior posts that were tagged “Montano” discuss the U.S. prosecution, conviction and imprisonment of Montano for U.S. immigration fraud and the proceedings for his extradition to Spain. See also CJA, U.S. Extradition of Montano; Drew, Unusual extradition fight plays out over priests’ slayings, Yahoo News (Aug. 18, 2015); Hodge, Former colonel faces extradition for charges of plotting Jesuits’ slayings, Nat’l Catholic Reporter (Aug. 24, 2015). Certification of Extraditability & Order of Commitment, In re Request By Spain for the Extradition of Inocente Orlando Montano Morales (No. 2:15-MJ-1021-KS, U.S. Dist. Ct., E. D. N.C., N. Div. Feb. 5, 2016); CJA Press Release, Judge Grants Extradition of Salvadoran Colonel Accused in Jesuit Massacre (Feb. 5, 2015); Malkin, U.S. Judge Approves Extradition of Former Salvadoran Colonel, N.Y. Times (Feb. 5, 2016). CJA, Spanish Judge Re-Issues Request for the Arrest of Military Officials, CJA (Dec. 2015); Dalton, Spain calls for arrest of 18 soldiers accused of killing priests in El Salvador, El Pais (Dec. 23, 2015); Reuters, El Salvador will cooperate in arrest of 17 former soldiers accused of killing priests, Guardian (Jan. 6, 2015); Labrador, Spain orders again capture Jesuit Salvadoran military case, elfaro (Jan. 5, 2016). Serrano, They asked military support of ARENA and right before the event of murdered Jesuits, LaPagina (Jan. 6, 2016). President recommends involved in Jesuit case to be delivered, Diario CoLatino (Feb. 6, 2016); Labrador, Captured soldiers accused in the Jesuit case, Elfaro (Feb. 5, 2016); PNC Accused Military Capture Jesuit Case, DiarioLatino (Feb. 5, 2015); Labrador, Police are still resisting capture by military Jesuit Case, Elfaro (Jan. 25, 2016). Posted on February 6, 2016 Categories Law, Other countries, ReligionTags 18 U.S.C. § 3184, Carlos Martín Baró, Center for Justice and Accountability (CJA), Christianity, David Morales, El Salvador, El Salvador Supreme Court, Federal Rule of Appellate Procedure 4(a), Federal Rule of Civil Procedure 73 (c), human rights, Humberto Corado, Ignacio Martín-Baró, INTERPOL, Jesuits, Magistrate Kimberly Swank, North Carolina, President Salvador Sanchez Ceren, Roman Catholic Church, S.J., Secretary of State John Kerry, Spain, Spanish Association for Human Rights (APDHE), U.S. District Court (Eastern District, United States of America (USA), universal jurisdiction3 Comments on Resumption of Spanish Criminal Case Over 1989 Salvadoran Murder of Jesuit Priests? On Sunday, May 10th, Pope Francis held an hour-long private audience at the Vatican with Raúl Castro, the President of Cuba. Immediately afterwards President Castro gave the Pontiff two gifts. One was a painting of a large cross made with several boats and a child praying to the cross; the Cuban artist Alexis Leyva Machado said the painting was referring to the suffering of thousands of African people trying to reach Europe by crossing the Mediterranean Sea. The other gift for the Pope was a medal commemorating the 200th anniversary of the Cathedral of Havana. In turn, the Holy Father gave Raúl a copy of his apostolic exhortation “The Joy of the Gospel” and a medal “St. Martin of Tours and the beggar covered with the mantle,” explaining that he gave it to world leaders because it recalls the obligation to help the poor and at the same time promote dignity. 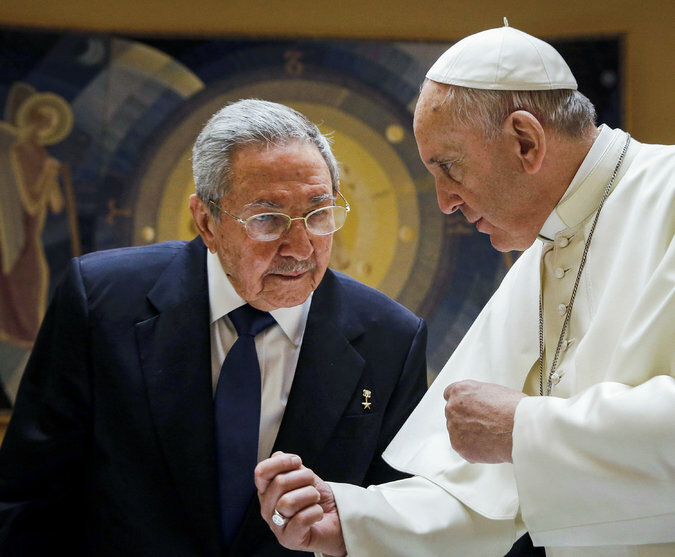 This post is based upon the following: Yardley, Raúl Castro Meets with Pope Francis at Vatican, N.Y. Times (May 10, 2015); Pullella, Raul Castro meets pope, says might return to the Church, Reuters (May 10, 2015); Scammell, Castro thanks Pope Francis for brokering thaw between Cuba and US, Guardian (May 10, 2015); Ordoz, Castro: “If the Pope continues, I’ll pray and return to the church,” El Pais (May 10, 2015) (Google translation); BBC, Raul Castro thanks Pope Francis for brokering Cuba-U.S. deal, (May 10, 2015); Francisco Raul and the Pope meet in historic meeting, Granma (May 10, 2015) (Google translation). The Cuban newspaper Granma previously cited report of this historic meeting and the subsequent press conference did not mention Castro’s comments about his plan to attend all the Pope’s masses in Cuba and perhaps to start praying and return to the Catholic Church. On May 6th Spain’s Supreme Court affirmed its High Court’s criminal investigation and prosecution of former Salvadoran military officials for the 1989 murders of six Jesuit priests and their housekeeper and her daughter at the University of Central America in San Salvador. The legal issue for the Supreme Court was whether a 2014 amendment to Spain’s statute regarding universal jurisdiction barred further proceedings in the case. Important for the Supreme Court’s conclusion that it did not were (a) the fact that five of the murdered priests were Spanish citizens and (b) “serious and reasonable” indications that El Salvador’s 1991 criminal trial in this case was not held to find those responsible for the murder but instead to obstruct justice, “all of it accompanied by the absence of the necessary guarantees of independence and impartiality.” One of the grounds for the latter reason was the resignation of the Salvadoran prosecutors after the country’s attorney general refused to allow them to call important military officials to testify at the trial. In previous developments in this case, Spain had issued arrest warrants for former Salvadoran military officials and requested their extradition to Spain, but El Salvador denied the request for most of these men. One of them (former Colonel Inocente Orlando Montano), however, had been living in the U.S., where he was prosecuted, convicted and imprisoned for lying to U.S. immigration about his military record in El Salvador, and on April 8, 2015, the U.S. government filed a request in a U.S. district court in Massachusetts seeking the extradition to Spain of Col. Montano for his alleged role in the 1989 Jesuit massacre. Montano will now face an extradition hearing before a U.S. magistrate judge and, if ruled extraditable, will be transferred to Spain to stand trial. Last month Spain’s Supreme Court upheld the dismissals of two High Court investigations of alleged human rights violations by Chinese officials in Tibet under Spain’s universal jurisdiction statute. Still awaiting decision by the Supreme Court are whether the amended universal jurisdiction statute permits investigations of the 1976 murder of Spanish diplomat Carmelo Soria during the Pinochet dictatorship in Chile and the 2010 Israeli attack on volunteers in the Freedom Flotilla, who were bringing aid to Gaza. This post is based upon the following: Spain’s Supreme Court, Press Release: The Supreme Court agreed that the High Court continue to investigate the death of five Spanish priests in El Salvador in 1989 (May 6, 2015); Rincoń, Supreme Court approves inquiry into 1989 Jesuit massacre in El Salvador, El Pais (May 7, 2015); Spanish Justice decides to investigate deaths of Jesuits in El Salvador, DiarioCoLatino (May 6, 2015). Previous posts examined the general international law principle of universal jurisdiction; Spain’s universal jurisdiction statute and its 2014 amendment. Other posts discussed El Salvador’s criminal prosecution regarding the Jesuits’ murders; the early history of Spain’s Jesuits case; Spain’s issuance of criminal arrest warrants in Jesuits case; other developments in Spain’s Jesuits case; Spain’s request for extradition in Jesuits case and El Salvador’s denial of extradition; and update on Spain’s Jesuits case.